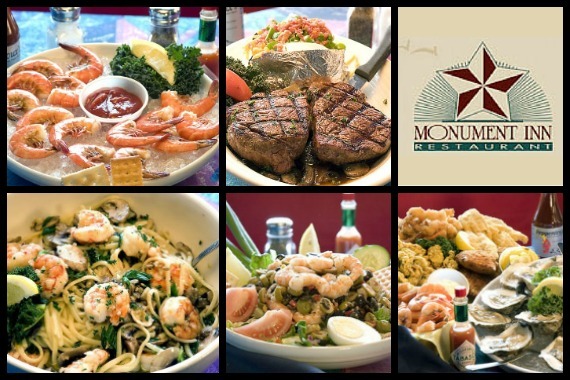 For over 25 years, Monument Inn has been your destination to share family traditions and special occasions with great food and a great atmosphere! "We're still closed because of the fire hazard of the ITC plant in Deer Park! More information here: http://bit.ly/2GsqTco"
"We are thankful for all the support you have given us these past three weeks. Watch our interview with KHOU here:"
"We will open when the authorities say it is safe for everyone to drive past the ITC incident site. We hope to see you again soon." "Unfortunately, due to the fire, we are still closed. Please watch our interview with KHOU here: http://bit.ly/2FHaxwc"
"Looking for your spring fling?" Killer fish and chips in a beautiful location, Suffering from some bad luck right now so when they reopen give them some love if you can, Well worth it for such a historical location! Yes, I'd like to receive news from Monument Inn. Sign up for the Monument Inn Newsletter!